A rare situation on the BoM Current Tropical Cyclones page at 1626 WST (1826 EST) with three cyclones in Australian waters simultaneously. The situation didn't last long as both Marcus and Iris soon dropped below cyclone status. BoM. For a few hours today there were three Tropical Cyclones present on the Bureau's Tropical Cyclone map. By far the most serious is TC Nora which is now at severe Category 3 on the Australian scale. The Tropical Cyclone Advice issued by the BoM at 2325 EST said that at 2200 Nora was crossing the coast at a tangent about 50km NNW of Pormpuraaw. It was a Category 3 system moving SSE at 20km/h with estimated sustained winds near the centre of 120km/h, gusting to 165km/h, and a central pressure of 976hPa. The Bureau said in the Advice "As the system is moving somewhat parallel to the coast, the period of crossing will be extended, and the cyclone is only expected to weaken slowly and may still be a Category 2 or Category 3 system as it approaches Kowanyama on sunday morning. "From later Sunday, the Tropical Cyclone is expected to continue gradually weakening as it becomes slow moving over land near the southwestern base of Cape York Peninsula. "The system may move back over water in the southeastern Gulf of Carpentaria late Monday or on Tuesday, where it may reintensify briefly to a Category 1 cyclone." 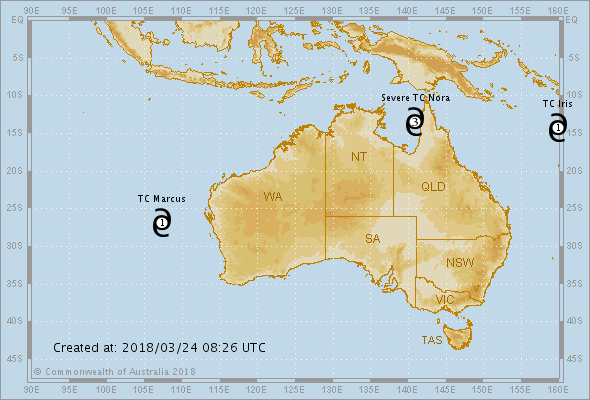 Meantime, TC Marcus off WA lost its cyclone status late this afternoon WST. Colder sea surface temperatures and a change in the upper air environment which sheared it apart, have resulted in its downgrading to a simple low pressure system with central pressure 996hPa. TC Iris has similarly been downgraded after less than a day at Category 1 cyclone status. It is moving SSW but is expected to swing to the SSE and to the west of New Caledonia. Bureau's "Latest Weather Observations" become more "latest" Sat 24 Mar 2018: The BoM publishes current weather information from all its automatic weather stations for each state and capital city, such as these for NSW and Melbourne. At present, these are updated each half hour, but from next week they will be updated every 10 minutes. These records are based on data that has been checked for gross errors but has not yet been fully validated. They are based on data received as at 1403 EST on 25/03/2018. Help in interpreting these statistics and information on quality control is here. Data is as received at 14:03EST, 25/03/2018.